I'm guessing the test was for forwarded traffic? And I'm hoping the test was not over wifi?!? And also not over the 100mbit ports? Any cpu usage data? With the listed config all traffic is processed in full -> no fast-track. 2011 is not as fast as 4011, but with the suggested change it can do much better. So did you enable fast track yet? No sorry i Will try it to morrow. 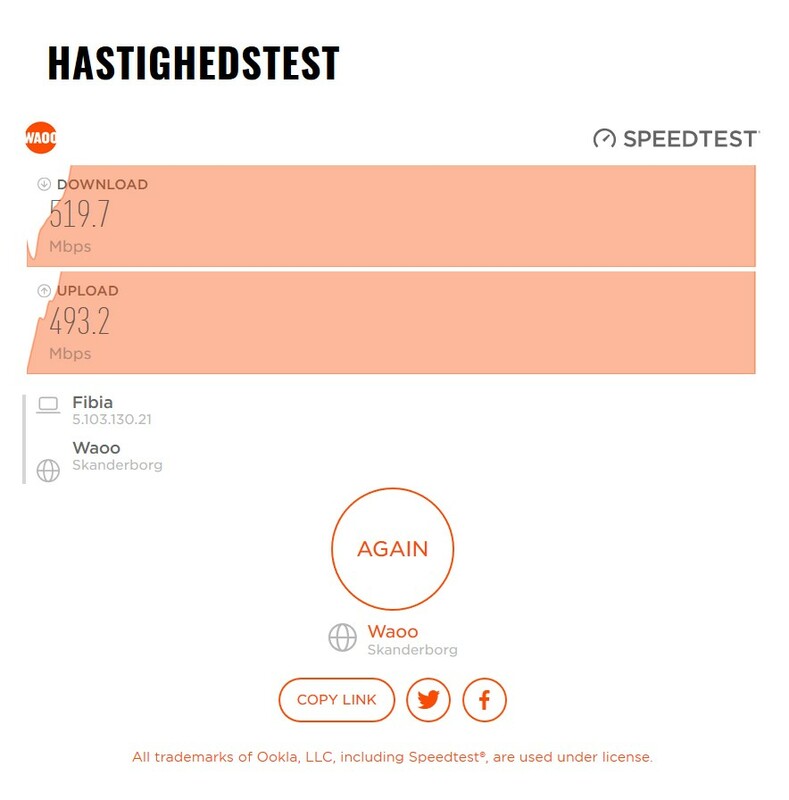 When a new connection was being put it a couple days ago, we started doing testing and saw poor performance on a RB2011 -- around 100 mbps when the cable modem was testing directly at 900+ mbps. Decided to really streamline the rules and make sure that we were using FastTrack. A bit better, but not as much as one would think. So we went ahead and swapped out the RB2011 with a RB3011 that we had on hand, and found that it doubled the speed to 300-400 mbps -- but still nowhere near the 900+ mbps that we saw on a direct connect with the cable modem. It feels to us like a bug in v6.43.8 -- any more that we can help provide to help identify? RB3011 w/fasttrack should reach 850Mbps easily, more or less depending on configuration. 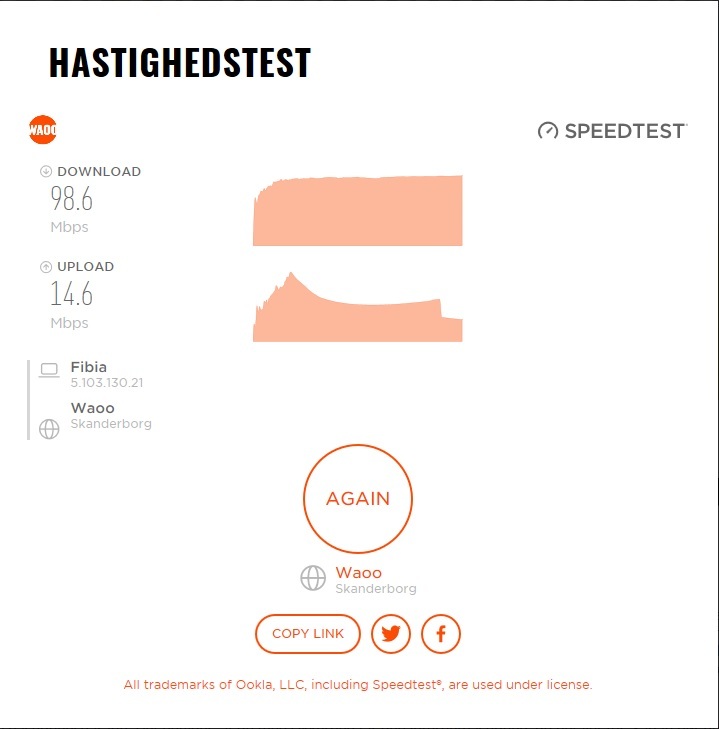 RB3011 at 6.43.8 reaches 335 Mbps without fasttrack and 550Mbps with fasttrack (500Mbps capped connection) in a single TCP connection based browser test. 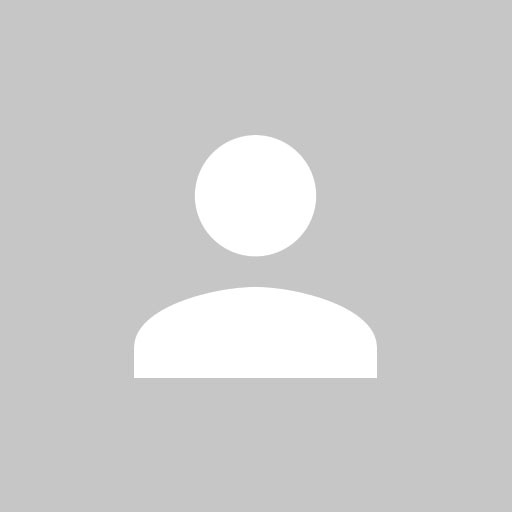 Are you perhaps using an IPv6 test server? If you have ipv6 disabled in the router, it won't connect to ipv6 websites or connections, right? Can you try downgrading to 6.36.4 or earlier os and firmware and see if you have normal speed with fasttrack? I just want to know if it's just my hardware (modem+router) or the 2011 itself/software bug. I'll be leaving cable for a fiber connection soon (either 250/25 or 500/50) so I will be able to test and see what happens on a different ISP/modem with the same router/config/computers. Speed is still bad, much worse at times: only 75-200 down. Have you ruled out the speedtest server as a possible issue? Have you tried to connect another computer to WAN and test the throughput using a tool like iperf? On our 2011 this is the scenario too. When I upgraded it to 6.40.9 because of winbox vulnerability, it slowed down to about 150/28 Mbps... on a 350/30 UPC ConnectBox modem. I glued to 6.40.9 because it is the latest version, which uses master/slave port config instead of Hw offloading. I'm using 6.44beta54 on my RB951G configured with traditional /interface ethernet setup, including VLANs in hardware ... and things work just fine. E.g. VLAN filtering works wire speed without RB's CPU noticing single bit. The only big difference on ROS change 6.40->6.41 is how ports are grouped to a switch group (6.40) or bridge (6.41), nothing else is forced by this SW change. So.. your RB951 has 1 (one) switch chip, my RB2011 has 2 (two) different speed switch chip, and I can't do bridge the bridges. In new time you simply add all 10 ports to the same bridge. Regardless, bridge will only see traffic sent towards it through switch1-cpu and switch2-cpu "interfaces" (those are actually old master-ports). The new bridge implementation doesn't mess with /interface ethernet switch settings unless you configure bridge with vlan-filtering=yes. Why, instead of whining, don't you just try? I tried... I can't got over about 100Mbps on the Giga ports. I think, this is because bridge is as fast as the slowest port in it. When current issue will corrected (150M max even with fasttrack...) I will try again. I wish MikroTik would help here. There is a serious issue with the later software or firmware or both. It's frustrating to see their synthetic test results, while we can only realize a very small fraction in real world scenario. With gigabit connections becoming more affordable, I'm now seeing MikroTik devices not keeping up. at about 120Mbs. I ended up using the providers router and and took the RB2011 home. At home I performed a factory reset with default config and got the same speeds in my Gig services. all other variables the same (computer, lan cable, modem, speed test site). sort of throttling). The hEX and RB4011 gradually speed up then maintain it's max speed. I have a CRS125-24G-1S with 200Mbs circuit which maxes out at 50Mbs running 6.43.8.
us which packages/firmware combination and which config will give us performance. Clearly vanilla/stock config does not cut the mustard. As a Tik admin you have a lot of features / possibilities in your hands, but also responsibility, as the choices made have significant impact. * vlans & bridging: latest software introduces bridge level vlans, but it's has only limited switch chip support. one ends up quickly with full cpu processing. using switch menu features is better for performance. * physical topology / connections of ports matters, see https://i.mt.lv/cdn/rb_files/RB2011iL-160620170215.png. if wan is on eth1-5 and lan on 6-10, 100mb is max one can get! Knowing the platform is important. Same story for hex (https://i.mt.lv/cdn/rb_files/RB750Gr3-d ... 140316.png & https://i.mt.lv/cdn/rb_files/RB750Gr3-e ... 152443.png), depending on how it is connected and configured, throughput could be capped to 500mbps, and that even before accounting for the bi-directional traffic. BTW, it's a user that mentioned something about "whining" not the company. That has been my question/problem from the beginning. I get if the bridge performance changes how things work, but is it possible to give some insight into why things are acting weird. Why did speed decrease only on wan traffic so dramatically since removing master/slave config? Why even with fasttrack enabled does speed start out normal but slow down so dramatically without a corresponding maxing out of cpu? Speed often remains slower in subsequent tests. Is this an internal device buffer problem or packet timing issue? Can I troubleshoot this? Why does cpu performance not go above 70-80% even when fasttrack is disabled? Unfortunately I don't have another gigabit capable device at the moment to check config, but will within a month or 2. @sebastia thanks for chiming in. Thanks for pointing out block diagrams, (which I'm already familiar with). I'm not sure what "if wan is on eth1-5 and lan on 6-10, 100mb is max one can get!" means. I certainly was not connecting to a 100Mb port and expecting greater than 100Mbs. Are you suggesting combining 1000Mbs and 100Mbs ports in same bridge, will degrade all 1000Mbs ports to 100Mbs Max? I'm not sure what I'm supposed to learn from your post. I asked some very direct questions and offered very direct challenge (please provide a working config that allows max NAT throughput). I understand CRS is classified as a switch. A 600Mhz CPU with very modest routing needs, should be handled with ease. MikroTik could be so much more if this forum offered real solutions vs pointing to existing documents. The Wiki is not clear, especially with so many variants of hardware and iterations of software advance. I don't think it's unreasonable to expect over 400Mbs from a RB2011 fully patched with default config, do you? According to MikroTik, the CRS125 and RB2011 display nearly identical routing test results. Please tell me why I shouldn't consider them both for routing purposes? If MikroTik doesn't show real world test results, how is anyone expected to pick the correct hardware for the desired workload? So again, I challenge anyone to show me a config that will route NAT on RB2011 at the hardware's maximum limit. Why can't we saturate the CPU with NAT traffic? Why does the RB2011 appear to throttle at 70-75% CPU utilization (or after a 1 dec celsius increase). My whining comment was not directly related to this thread, but from MikroTik employee at a MUM presentation. I thought it was a worldly know fact (how MikroTik feels about it's user base complaining about misrepresented stats). real world and when people ask for help, they simply get pointed to existing documentation, without any explanation. without any first hand instruction. Many of us need some on on one help. apprehension to share real world examples and individual help? posted a config that can do such. It's a simple request. Please help educate your consumers MikroTik. I have managed to get ~ 850Mb/s with RB2011, using NAT (No PPPoE). About a year ago, the RB2011 retired to my lab area and has been replaced with a HAP AC2 and I no longer have a 1Gb/s Internet link. Why do you not start by providing your full config, and we can make suggestions? Well hopefully I'll be able to call myself an idiot when all said and done! left some configs, that I didn't expect to see. Here is the config that I last use (which I expected to be bone stock default, out of the box experience). would be in the default config). I see how firewall rules were carried over in reset, but the address lists weren't? I'll have to do a better reset and try again. My previous post was mean to provide perspective and context: performance depends not only on hardware, but also software, configuration and topology. There is no one good solution. Why don't you un-retire the RB2011, install new ROS and firmware and see what sort of performance change you get, vs whatever ISP speeds you get with your hap AC2? What is your link speed currently? I remember you had given up after I reset to plain vanilla on page 1. Back in the times I had a 1Gb internet, my one son (Serious gamer) was living with us and he paid for the link. This is not the case anymore, he has moved out, moved the 1Gb link with him, so now I have a measly 40/20 fibre link so will not prove anything anymore unfortunately. This offers no real firewall protection. Does anyone have any suggestions what to add to firewall to make it more secure, but not slow throughput? and ended up with the following config, which still yielded 750-800Mbs NAT download. RULE BEFORE YOU MAKE SURE ABOUT ALL ACCEPT RULES YOU NEED"
Thanks to everyone (@sebastia & @CZfan) that helped me on my journey. Queues don't work with fasttrack. If I need Queues, I'll need a more powerful model. Next test is to see if I can use Queues with RB4011 and still get high throughput. I was also able to modify my existing firewall rules on RB750 G3. I made sure FastTrack was enabled and working correctly. I now get over 900Mbs on my hEX! Well done, glad I could help. Well, I reset my 2011 to no config, copied and pasted your config and I still have exactly the same performance as before. This is irritating. It doesn't stay this good of course. If i hook directly to the modem it runs flat out and they tell me it's my router. This modem isn't a "router", so can't put it into bridge or pass thru mode (i thought double nat issue maybe). I spent 3 hours one evening getting escalated and bounced around. I upgraded to a RB4011iGS+5HacQ2HnD and it's running max speed every time at around 4% CPU out of the box.